Submitted by JoeKeresztury on Mon, 07/18/2011 - 01:57. Many homes now have underground electrical service to their home in the San Antonio and surrounding areas. Overhead service is still used in some areas and below is an image of the requirements for the clearances of overhead service to your home. Starting at the left side of the utility pole the electrical service line must be at least 18 feet above any road or street. This may vary with local jurisdictions or utility companies. As the service comes over the property, it must be at least 12 feet high above the driveway. The line must be generally 12' above grade. Areas that are only accessible to pedestrians must be at least 10' above grade. The service connection to the overhead mast on the roof must also be at least 10 ft. high. On the right side of the utility pole as seen above, the service line must clear a flat roof by at least 8 feet. This applies to all roofs less than a 4-in-12 slope. Over a 4-in-12 pitch the service wiring must clear the highest point or ridge by a minimum of 3 feet. At deck or balcony areas the service must be out at least 3' and a minimum of 10 ft above flooring level. Around the sides and below windows there must be a minimum 3 ft. distance and the 3 foot clearance also apllies to out and away from windows. Trees should always be trimmed back away and clear of electrical service wiring, not just at the connection to the home, but at all areas of the overhead electrical service. 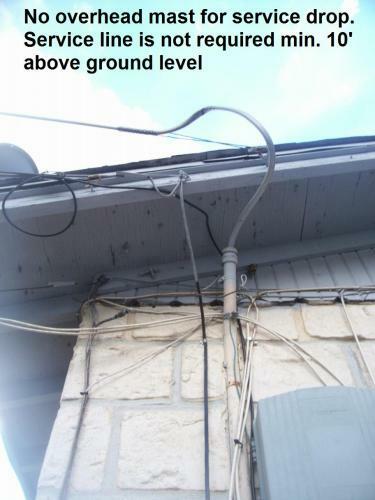 This photo (left) on a San Antonio area home that is over 50 years old is missing the goose neck mast on the roof and the service entrance wiring drop is not at the required minimum 10 feet off the ground. As seen in the upper left photo the tree(s) clearly need to be trimmed back away from the overhead service entrance drop area at this San Antonio home. 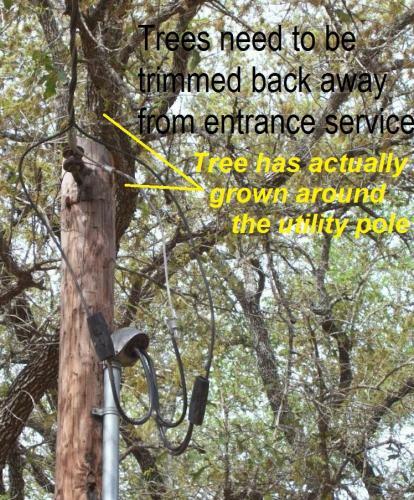 In the 2nd photo (right) at this home inspection in Floresville, Texas, the home had a large acreage lot that had the service drop, meter and main service panel at this utility pole, close to the house. From there the electrical to the home was underground. 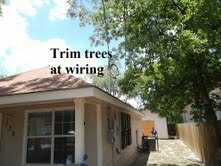 The trees around this service wiring and utility pole area also needs to be trimmed back and away quite a bit. A tree as seen in the picture appears to actually have wrapped around the utility pole right by the electrical line connection to the pole. Performing Home Inspections in San Antonio, Schertz, Cibolo, Floreseville, Boerne and all surrounding South Texas areas. Submitted by Jeffrey R. Jonas (not verified) on Tue, 10/11/2011 - 09:00. Great information for a homeowner to have, so when they do their monthly maintenance walk around, they may notice a potential hazard, and have it corrected before something serious occurs.